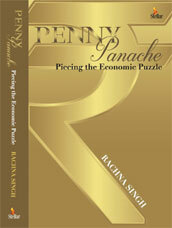 Penny Panache is an assortment of articles on a range of economic issues that have made headlines of late. Vagaries of the stock exchange and real estate, the volatility in the prices of crude oil and gold, the rate hike tremors, the inflation predictions, currency wars, tax havens, algorithm trading, start-up revolution, et al, have been avidly discussed and analysed with acumen and skill. enjoy the thrills and spills of economic tales that have all the nail-biting finish of suspense stories narrated adroitly. Given her unusual amalgam of literary creativity and financial panache, Rachna Singh defies the conventional image of a writer. She accomplished her Masters in English Literature from Punjab University with a gold medal for academic excellence and a special medal for distinction in Linguistics. It was an encore as her MPhil in English Literature also won her a gold medal. However, providence delineated a completely diverse trajectory. She joined the Indian Revenue Service in 1991, and after imbibing the intricacies of finance, taxation, economics and law at the National Police Academy, Hyderabad and National Academy of Direct Taxes, she joined as Assistant Commissioner Income Tax. Currently, Commissioner Income Tax, in these 25 years in her parent department, she not only updated her skills in financial matters but also equipped herself with a doctorate. Notwithstanding the pressures of a demanding career, she continued to pursue her passion in writing and penned columns for various national dailies, and also authored a book, Myriad Musings, released recently.